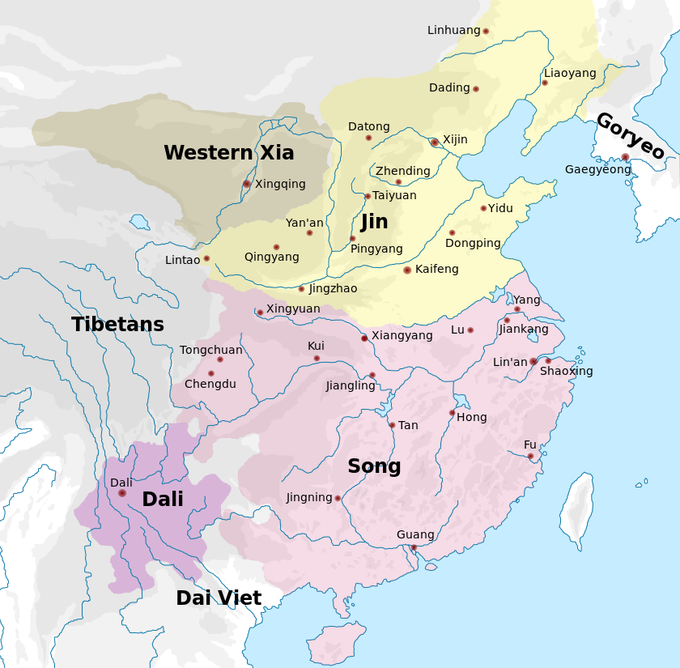 After the Jins captured the Northern Song capital of Kaifeng, they went on to conquer the rest of northern China, while the Song Chinese court fled south and founded the Southern Song dynasty. Although weakened and pushed south beyond the Huai River, the Southern Song found new ways to bolster its strong economy and defend itself against the Jin dynasty, especially through the creation of the first standing navy of China. The Jin-Song Wars engendered an era of technological, cultural, and demographic changes in China, including the introduction of gunpowder into weaponry. Though the Song dynasty was able to hold back the Jin from their southern territory, a new foe came to power over the steppe, deserts, and plains north of the Jin dynasty—the Mongols led by Genghis Khan. The Mongols were at one time allied with the Song, but this alliance was broken when the Song recaptured the former imperial capitals of Kaifeng, Luoyang, and Chang’an at the collapse of the Jin dynasty. The Mongols continued to war with the Song, eventually founding the Yuan dynasty under Kublai Khan, thus ending the Song dynasty. The fifth Great Khan of the Mongol Empire and founder of the Yuan dynasty in China as a conquest dynasty in 1271; he ruled as the first Yuan emperor until his death in 1294. An East-Central Asian ethnic group native to Mongolia. The founder and Great Khan (emperor) of the Mongol Empire, which became the largest contiguous empire in history after his death. After capturing Kaifeng, the Jurchens went on to conquer the rest of northern China, while the Song Chinese court fled south. They took up temporary residence at Nanjing, where a surviving prince was named Emperor Gaozong of Song in 1127. Jin forces halted at the Yangtze River, but staged continual raids south of the river until a later boundary was fixed at the Huai River further north. With the border fixed at the Huai, the Song government promoted an immigration policy of repopulating and resettling territories north of the Yangtze River, since vast tracts of vacant land between the Yangtze and the Huai were open for landless peasants found in the Jiangsu, Zhejiang, Jiangxi, and Fujian provinces of the south. Though weakened and pushed south beyond the Huai River, the Southern Song found new ways to bolster its strong economy and defend itself against the Jin dynasty. It had able military officers such as Yue Fei and Han Shizhong. The government sponsored massive shipbuilding, harbor-improvement projects, and the construction of beacons and seaport warehouses to support maritime trade abroad, including at the major international seaports, such as Quanzhou, Guangzhou, and Xiamen, that were sustaining China’s commerce. To protect and support the multitude of ships sailing for maritime interests into the waters of the East China Sea and Yellow Sea (to Korea and Japan), Southeast Asia, the Indian Ocean, and the Red Sea, it was necessary to establish an official standing navy. The Song dynasty therefore established China’s first permanent navy in 1132, with a headquarters at Dinghai. With a permanent navy, the Song were prepared to face the naval forces of the Jin on the Yangtze River in 1161, in the Battle of Tangdao and the Battle of Caishi. During these battles the Song navy employed swift paddle-wheel driven naval vessels armed with trebuchet catapults aboard the decks that launched gunpowder bombs. Although the Jin forces commanded by Wanyan Liang (the Prince of Hailing) boasted 70,000 men on 600 warships, and the Song forces only 3,000 men on 120 warships, the Song forces were victorious in both battles due to the destructive power of the bombs and the rapid assaults by paddle-wheel ships. The strength of the navy was heavily emphasized after that. A century after the navy was founded it had grown in size to 52,000 fighting marines. Southern Song era ship. A Song era junk ship, 13th century; Chinese ships of the Song period featured hulls with watertight compartments. The Jin-Song Wars engendered an era of technological, cultural, and demographic changes in China. Battles between the Song and Jin brought about the introduction of various gunpowder weapons. The siege of De’an in 1132 was the first recorded appearance of the fire lance, an early ancestor of firearms. There were also reports of battles fought with primitive gunpowder bombs like the incendiary huopao or the exploding tiehuopao, flammable arrows, and other related weapons. The Song government confiscated portions of land owned by the gentry in order to raise revenue for military and naval projects, an act which caused dissension and loss of loyalty amongst leading members of Song society, but did not stop the Song’s defensive preparations. Financial matters were made worse by the fact that many wealthy, land-owning families—some of which had members working as officials for the government—used their social connections with those in office to obtain tax-exempt status. Southern Song in 1142. The extent of the land holdings of the Southern Song dynasty, significantly reduced from Northern Song’s holdings by the Jin dynasty. Although the Song dynasty was able to hold back the Jin, a new foe came to power over the steppe, deserts, and plains north of the Jin dynasty. The Mongols, led by Genghis Khan (r. 1206–1227), initially invaded the Jin dynasty in 1205 and 1209, engaging in large raids across its borders, and in 1211 an enormous Mongol army was assembled to invade the Jin. The Jin dynasty was forced to submit and pay tribute to the Mongols as vassals; when the Jin suddenly moved their capital city from Beijing to Kaifeng, the Mongols saw this as a revolt. Under the leadership of Ögedei Khan (r.1229–1241), Mongol forces conquered both the Jin dynasty and Western Xia dynasty. The Mongols also invaded Korea, the Abbasid Caliphate of the Middle East, and Kievan Rus’. The Mongols were at one time allied with the Song, but this alliance was broken when the Song recaptured the former imperial capitals of Kaifeng, Luoyang, and Chang’an at the collapse of the Jin dynasty. The Mongol leader Möngke Khan led a campaign against the Song in 1259, but died on August 11 during the Battle of Diaoyu Fortress in Chongqing. Möngke’s death and the ensuing succession crisis prompted Hulagu Khan to pull the bulk of the Mongol forces out of the Middle East, where they were poised to fight the Egyptian Mamluks (who defeated the remaining Mongols at Ain Jalut). Although Hulagu was allied with Kublai Khan, his forces were unable to help in the assault against the Song due to Hulagu’s war with the Golden Horde. Kublai continued the assault against the Song, gaining a temporary foothold on the southern banks of the Yangtze. Kublai made preparations to take Ezhou, but a pending civil war with his brother Ariq Böke—a rival claimant to the Mongol Khaganate—forced Kublai to move back north with the bulk of his forces. In Kublai’s absence, the Song forces were ordered by Chancellor Jia Sidao to make an opportune assault, and succeeded in pushing the Mongol forces back to the northern banks of the Yangtze. There were minor border skirmishes until 1265, when Kublai won a significant battle in Sichuan. From 1268 to 1273, Kublai blockaded the Yangtze River with his navy and besieged Xiangyang, the last obstacle in his way to invading the rich Yangtze River basin. Kublai Khan officially declared the creation of the Yuan dynasty in 1271. In 1275, a Song force of 130,000 troops under Chancellor Jia Sidao was defeated by Kublai’s newly appointed commander-in-chief, General Bayan. By 1276, most of the Song territory had been captured by Yuan forces. In the Battle of Yamen on the Pearl River Delta in 1279, the Yuan army, led by General Zhang Hongfan, finally crushed the Song resistance. The last remaining ruler, the 8-year-old emperor Emperor Huaizong of Song, committed suicide, as did Prime Minister Lu Xiufu and 800 members of the royal clan. On Kublai’s orders carried out by his commander Bayan, the rest of the former imperial family of Song were unharmed; the deposed Emperor Gong was demoted, given the title “Duke of Ying,” but was eventually exiled to Tibet, where he took up a monastic life. The former emperor would eventually be forced to commit suicide under the orders of Kublai’s great-great grandson Gegeen Khan, who feared that Emperor Gong would stage a coup to restore his reign. Other members of the Song imperial family continued to live in the Yuan dynasty, including Zhao Mengfu and Zhao Yong.